Lately you have probably been hearing about what’s called 1080p/24 – a new feature that has just become available with the introduction of Blu-ray and HD DVD. I will try to explain this nomenclature in an easy to understand way. To start with, I have previously written about what 1080p is, and I would advise you start there. A quick overview: 1080 is the number of vertical lines of resolution, and “p” stands for “progressive.” This means 1,080 lines are displayed constantly. 24p is what we will focus on in this article. This is a bit more involved, so I will have to go back in time, so please indulge me. Back in the early days of Hollywood film making a lot of standards were developed that we still use today. Among these standards are the Academy film ratio (1.85:1), Cinescope (2.35:1) and 24 frame per second cameras. This frame rate was selected as a balance between natural looking human expression and cost. When making a movie, film stock gets expensive and when you film at 24 frames per second it uses less film than 50 frames per second, less than half the cost actually. With the advent of television new standards were created. Although they used the aspect ratio of film (1.33:1), they chose 60Hz to broadcast television programs (later, in PAL regions they chose 50Hz). Hertz (Hz) is cycles-per-second, so 60Hz is 60 frames per second. Here is where the problem begins. When reproducing a 24fps at 60Hz everything would be sped up and it would look like you were watching the film in fast-forward. To solve this problem, Faroudja created a technique called Telecine. This is often called “3:2 pulldown.” This process creates four film frames for every five video frames and then plays alternating frames three times each and two times each and alternates every four frames. 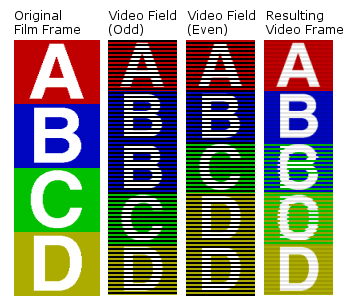 This means four film frames play in the time it normally takes to to play five video frames. However, this process has changed over time. Progressive-scan video and high-definition video has made it so one frame is added to every four (playing one frame three times and the next twice) to make it easier to upconvert and to compress. Both processes cause “judder” but the second causes a bit more. Below you can view a visual demonstration of the Telecine 3:2 pulldown. Judder causes the image to jerk a bit. Usually this isn’t much of a problem, but in scenes that pan this judder can be seen and is often distracting. Pioneer was ahead of everyone for years making their plasma televisions operate at both 60Hz and 72Hz. Why does this matter? Let’s do some math. 60 divided by 24 = 2.5 and there is no such thing as half a frame, which is why it is necessary to add an extra frame. 72 divided by 24 = 3 so each frame only needs to be played three times, eliminating the need for the telecine process. Blu-ray Disc is encoded at 1080p/24p right on the disc. HD DVD is encoded at 1080p/30p with a layer of metadata that flags the duplicate frames so if it is output at 24p it will drop all the flagged frames for a 1080p/24p output. Starting this year, several companies have started manufacturing LCD panels with 120Hz refresh rates. 120 can be divided by both 24 and 30 with an even number of frames. Most 1080p front-projectors can natively display 24fps. Pioneer still has the 72Hz plasma panel. Since there are already dozens of Blu-ray and HD DVD players out right now I’m not going to list all the capable players, but this is a spec that is listed, not one of those hidden specs like what version HDMI it has. But what is important is that both the player and television must support 24p for you to get this feature. So is it worth it? 24p has a natural film quality to it that you don’t get from any other digital source. Of course when you are engrossed in a film, the judder usually doesn’t distract from the story on the screen, and that’s what is important. Don’t go out of your way to get 24p unless you’re quite serious on getting the best video possible. I’m convinced that you will enjoy Blu-ray and/or HD DVD enough without having to worry about technicalities of a frame rate. *Even though the new LCD’s have 120hz rates, I believe that no LCD’s can truly display 24 fps or a multiple of 24 fps yet. The 120 rate is actually 30hz x 4, so film 24fps is converted to 30fps, which introduces judder, and then additional frames are “interpolated” to 120fps, so it almost looks smoother than reality. (It actually can look wierd, especially on film source material.) I can’t believe it is still so difficult to see through the marketing language, but to my knowledge, no LCD’s display 24p. The big question is why do LCD manufacturers refuse to simply display the true movie frame rate? Is LCD technology not capable of it? I want NO JUDDER! Because 120/24=5 it means a 24fps film would show the same frame 5 times in a 120Hz setting. For some reason the LCD manufacturers show the one frame and then interpolate four intermediary frames. Some TVs can do both though. I forget which ones. We have a Samsung Blu-ray Player BDP1500 and a Samsung LN52A750 and the movie images appear to are move too fast. Is there any setting/s that we should be using to adjust this problem? Your TV has independent settings for each input. Make sure you are using the BD player input to adjust settings for this player. This includes color, contrast and sharpness settings as well. You can use a Blu-ray movie with a THX optimizer (such as Pixar’s Cars) to adjust video settings. For your TV start with “Movie” mode. You should try turning Auto Motion Plus off. This is a processing I talk about in the article which is intended to smooth out film, but it just makes it act weird. For the BD player, make sure you have the latest firmware installed. You can download it at the Samsung website. Make sure the BD player video output settings are set for Auto. This will automatically determine if the source is 24fps or 60fps and deliver it to the TV appropriately.